Multiple media outlets are reporting that suspended Notre Dame cornerback KeiVarae Russell was notified yesterday by the Honor Committee and informed his teammates that he will not be allowed to play for the Irish during the 2014 football season. 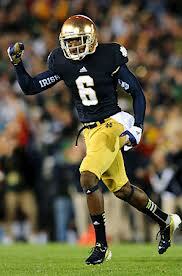 Russell however also stated that he plans to return to Notre Dame to play for the Irish next season. This news comes after rapid speculation that all five of the Irish players that have been under investigation for academic fraud would not play for Notre Dame this season and their fates with the university still unclear. While Russell has always made it very clear that he wanted to play in the NFL, I am not surprised that he plans to return to Notre Dame next season. Russell has the skills and the athletic ability to be a very good player in the NFL however with him not playing for an entire football season, it was very likely that his draft stock would have fallen from a possible first round pick to a mid to later round pick. Notre Dame was already looking at the possibility of returning 10 starters on defense for next season and if Russell does indeed return to Notre Dame that would make 11 returning starters for next years defensive squad. 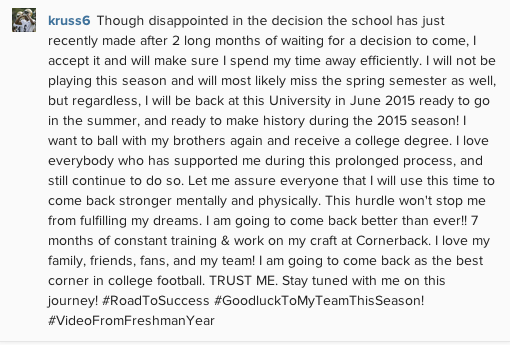 Keivarae Russell posted on his Instagram account that he will not play this season but will return for 2015.